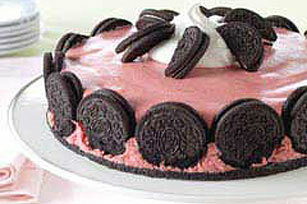 Bring an OREO Strawberry Mousse Cake to your next springtime event. A fluffy mix of strawberry gelatin, blended strawberries and whipped cream is chilled in a cookie crust for a luscious dessert. OREO Strawberry Mousse Cake pairs two favorite flavors in one soon-to-be-favorite recipe! Cut 3 of the cookies in half; set aside. Finely crush 12 of the remaining cookies; mix with margarine. Press firmly onto bottom of 9-inch springform pan; stand remaining 14 cookies around edge of pan. Dissolve gelatin in boiling water in large bowl; stir in cold water and strawberry puree. Refrigerate until slightly thickened. Beat gelatin with electric mixer on high speed 2 minutes or until foamy. Gently stir in 2 cups of the whipped cream. If necessary, refrigerate until mixture is thick enough to mound. Spoon into crust. Refrigerate 4 hours or until firm. Run knife or metal spatula around rim of pan to loosen dessert; remove rim of pan. Top with remaining whipped cream and halved cookies. Garnish with additional strawberries and mint sprig, if desired. Store leftover dessert in refrigerator. Substitute raspberries for the strawberries.